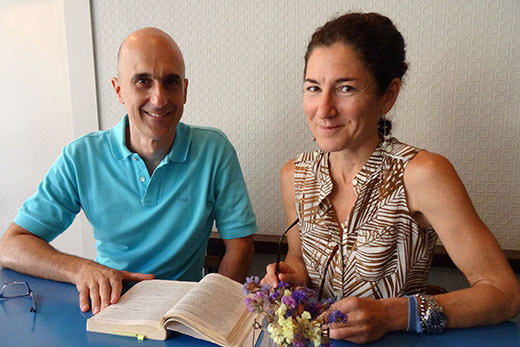 Roxani Margariti (right), an associate professor in Emory College’s Department of Middle Eastern and South Asian Studies, worked with Antonis Anastasopoulos (left), a professor in the Department of History and Archaeology at the University of Crete, to design and teach a graduate seminar. Roxani Margariti, an associate professor in Emory College’s Department of Middle Eastern and South Asian Studies, recently won a Greek Diaspora Fellowship to design and teach a graduate seminar in the field of medieval Middle Eastern and Islamic history at the University of Crete. The fellowship allowed Margariti the opportunity to spend two months over the summer in Rethymno, a historic city and university town featuring Venetian and Ottoman monuments and bustling tourism. It also gave her the chance to teach in her native country and language for the first time. The seminar was designed to provide new historical and historiographical vistas in Islamic history to graduate researchers in Turkish Studies and Byzantine and Medieval Studies. The fellowship included in-depth discussions with faculty at the University of Crete and the affiliated Institute for Mediterranean Studies on the development of course segments that might be included in the existing curriculum or could stand alone toward a new direction of study there. Margariti and her peers also discussed the possibility of a joint summer abroad program for Emory and the University of Crete, as well as an academic conference on the theme of technologies of power, which emerged as a possible focus of interdisciplinary inquiry. Those discussions are ongoing. “I found it very helpful to become familiar with the curricula of these programs and to learn more about my colleagues' and their students' research projects in local Ottoman archives, archaeological excavations, digital recording of the island's rich material cultural heritage and much more,” she says. Margariti was among 30 Greek- and Cypriot-born scholars selected for the second round of the fellowship. The Institute for International Education manages the program, launched in 2016, in collaboration with the Fulbright Foundation in Greece and the Stavros Niarchos Foundation (SNF). “One of the main goals of the Greek Diaspora Fellowship Program has been to engage productively one of Greece’s most important assets, its diasporic academic community,” said Stelios Vasilakis, director of programs and strategic initiatives at SNF. Margariti says the fellowship exposed her directly to the ways her field of medieval Middle Eastern and Islamic history resonates in that part of Europe, where histories and societies aren’t habitually thought of as the “Middle East,” yet have been part of the expansive geohistorical continuum of that region. “This is particularly true now that the Syrian civil war and other unrest in the greater Middle East and North Africa are driving more and more people through Greece in hopes of a more viable future in Europe,” Margariti says.